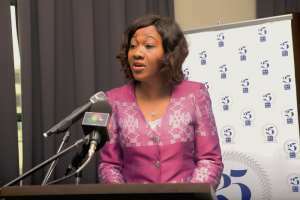 Things are falling apart at the Electoral Commission, EC which are raising concerns about the competency and neutrality of the newly appointed members of the commission after the president ousted Mrs. Charlotte Osei. Even though the concerns keep mounting on a daily basis, the chairperson, Mrs. Jane Mensah claims to have restored the commission’s integrity. This follows the return of the original logo of the commission and parting away with the one introduced by the ousted chair of the commission. But apart from hallucination and propaganda to portray her predecessor as a bad person, it is not clear what else informed the decision of Mrs. Jane Mensah to make that public pronouncement. In the minds of many right thinking members of the public, the mere throwing away of the logo introduced by her predecessor, does not restore integrity at the commission. It, rather, takes hard work, common sense, intelligence, due diligence, humility, respect for others, tolerance among others to restore integrity. However, recent developments at the EC have created doubts on the minds of many Ghanaians about the said integrity Jane Mensah restored. The sequence of events under her are gradually pointing to the fact that she is on a mission to rather soil the highly won reputation of the EC. A communique issued by the commission last week stated categorically that all the parties at an IPAC meeting have agreed to the EC’s position to compile a new register for 2020. The NDC quickly refuted this claim by the EC and insisted that no such a thing was tabled for deliberations and consideration during the said meeting. This position was corroborated by other parties that took part in the meeting, a situation that raised eyebrows about how the EC under Jane Mensah was going to conduct itself. In a rather bizarre circumstance, the ruling party has joined forces with those in opposition to blast the commission for peddling a palpable falsehood. But in their defence, a deputy commissioner, Dr Bossman Asare only depicted either his lack of knowledge on the field, his strong dislike for the NDC or both. In an interview with Joy Fm’s Evans Mensah, Dr Bossman was just too full of himself and perhaps took the discerning listeners to be level 100 students of his class. He kept flexing his muscles and ended up stating categorically that the EC was not obliged to take advice, consult the parties or seek their opinions before taking sensitive decisions like the one they took. As ignorant as he might be on the subject matter, his demeanour, posture and hatred for the NDC took the better side of him which caused him to receive more punches. The point is, how on earth could a reputable institution like Ghana’s EC think that its major stakeholders are less important in major decision makings? Why is the former lecturer in so hurry inviting people to question his integrity as a member of the commission? Could it simply be that perhaps he was not around when the chairperson was restoring the integrity of the commission? Was Dr Bossman exempted from working with the integrity of the commission that Jane Mensah told the world that she has restored? Sorry but “I can’t think madness” about him and his position on this very sensitive issue which could make or break the integrity of the commission. It would be good if he could go back to the lecture theatre and keep polluting the minds of the younger ones entrusted to him in a way that would suit his love for the NPP. In a public space like this however, he cannot ignite a public discourse like he did and expect to enjoy immunity under academic freedom. If he cares to know, steeping so low into the gutters meant that he indeed wanted to swim in it therefore, he must be prepared to face the accompanying consequences. Per his outburst on radio to respond to the NDC, he was so reckless to opine that IPAC has no say in what they do at the commission. I pity him because he sounded so funny and displayed sheer arrogance and emptiness which required him to start learning in that office. In a multi-party democracy like ours, political parties are major stakeholders and must be accorded that respect. Dr Bossman and Mrs Jane Mensah are currently so full of themselves and appear to have no respect for other your principal stakeholders. The posture and demeanour of the two of them especially the attitude of Dr Asare, displays that events ahead of us to come have already started casting their ugly shadows. Since Mrs Jane Mensah, Dr Bossman and other commissions benefited from the ousting of Mrs Charlotte by the powers that be, they have been trying hard to soil the integrity of the commission. Their first major assignment which was the referendum regarding the creation of new regions was marred by fraudulent activities by some of their assigns. In post-election videos and still pictures that went viral, some of the election day officials were seen tump printing ballot papers and dropping same as ballots cast. No wonder in some areas, turnout was as high as 99% but months after the incidents, findings of the EC’s investigations into the matter are yet to be made known. Mrs Jane Mensah’s kpalogo dance with what happened during the Ayawaso by-election led many people wonder whether she had indeed restored the integrity of the commission. If after dumping the logo that instilled integrity in the commission, Mrs Charlotte Osei was able to organise one of the finest elections in this country, then Jane Mensah has a tall mountain to climb. They cannot disappoint the appointing authority that appointed them because Ghanaians are wild awake and waiting.